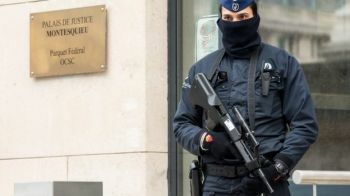 A suspected jihadist group targeted in a major anti-terror raid on Thursday had been planning to kill policemen in the street and at police stations, Belgian prosecutors say. The planned attacks were imminent, they said, adding that two suspects shot dead in Verviers during the raids were still being identified. Thirteen suspects have been arrested, while two more were arrested in France. Guns, munitions and explosives, as well as police uniforms and a large amount of money, were seized during the raids, prosecution spokesman Thierry Werts told reporters. Eric Van Der Sypt, another spokesman, added: "The investigation... has shown that these people had the intention to kill several policemen in the street and at police commissariats [police stations]. Belgian Federal Prosecutor Thierry Werts: "A number of weapons were discovered"
"The operation was meant to dismantle a terrorist cell... but also the logistics network behind it," he said. However, he added that he could not confirm that everyone in the jihadist group had been arrested. Protective measures would be put in place at police buildings, he said. No link had been established with last week's attacks in Paris, Mr Van Der Sypt said, adding that Belgium would seek the extradition of the two suspects in France. "I can confirm that we started this investigation before the attacks in Paris," he said. Last week, gunmen in Paris attacked the offices of satirical magazine Charlie Hebdo, a kosher supermarket and police officers, killing 17 people in the French capital. Belgian Prime Minister Charles Michel thanked the French authorities for detaining the suspects in France. He told the public there was no need to panic, and that his government would "take measures" to ensure the safety of civilians. The government announced additional steps to combat terrorism, including implementing laws that would allow the country to deprive dual nationals of Belgian citizenship if they were considered a threat. 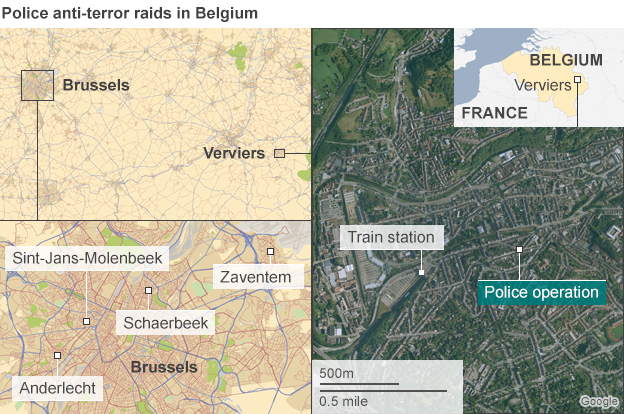 Gilles de Kerchove, a counter-terrorism co-ordinator for the EU, told the BBC he was "not surprised" there were plans for attacks in Belgium, because the country had "suffered in a way from the high number of people going to Syria and Iraq" to fight. The suspects shot dead on Thursday had returned from the country, police said. They had shot at police "for several minutes" before being killed, prosecutors added. The terror threat level in Belgium has been raised to three - the second highest.